Thomas and Adamson have been appointed as project managers for a £37m refurbishment of the Royal Commonwealth Pool by Edinburgh City Council. A job of particular import to the film as Frank Thomas, one of the original partners of T&A, coached Olympic gold medal swimmer David Wilkie. 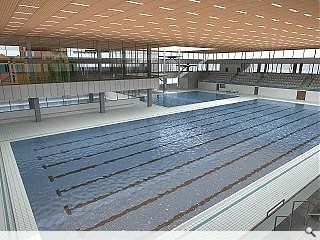 The Grade A listed building is being readied as the diving venue for the 2014 Commonwealth Games with a new 50m pool, 25m Diving Pool and 25m Training Pool. Upgraded changing rooms, gym, café, dry dive training facility and a new children’s play area are also provided. These works will involve extensive structural alterations along with an overhaul of the mechanical and electrical services installation, to take advantage of long term energy efficiency and sustainability proposals. Alastair Wallace, Partner, Thomas and Adamson said, "It gives us real pride to be able to contribute to providing such a key venue for the Commonwealth games particularly because of the link with T&As beginnings. We look forward to seeing the pool in action training Scotland's swimming stars of the future." The Commonwealth Pool is due for completion in the summer of 2011 and John Graham (Dromore) Ltd has been appointed as the main contractor for the two year construction programme.